Planning a family vacation on a tight budget is challenging and exciting at the same time. (The challenge?) Travel doesn't have to be expensive, so I always do a little research in order to reduce our travel expenses. (What's fun and exciting?) I love browsing photos and stories of places I haven't been to. I've been travelling with friends for some time and I want to be with my family this time. So I've arranged a vacation treat for my parents and grandmother. I know that they aren't getting any younger so I want to let them experience things they haven't done yet and see places they haven't been to. 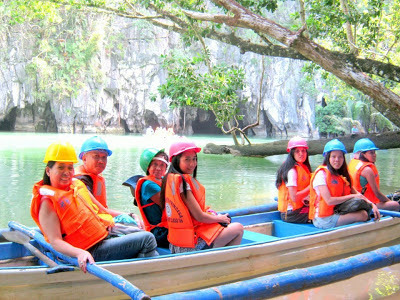 Nonetheless, they enjoyed everything in Palawan (scenery, food and specially the people). Let me share with you our home away from home in Palawan. After reading some reviews of different hotels in Palawan, I decided to book at Tres Pension for our accommodation in Puerto Prinsesa, Palawan. I made my reservation weeks in advance and all my queries were promptly answered trough email. Tres Pension is a Japanese inspired pension house. It is well maintained and the place is very clean. It has a garden that is very pleasing to the eye and the ambiance is just so serene and peaceful. If you love taking pictures, you will definitely love this place. We stayed at Tres Pension last December 2012. It is just 7-10 min away from the airport and the busy town. My parents and lola love the place! They find it very relaxing and homey. A great place to just sit back and relax after the fun and exhausting Ugong Rock Adventure and Underground River tour. Tres Pension is one of the most comfortable and affordable places I have ever stayed at. Vivian, the owner of the pension house, and the staff were very considerate and accommodating. We were able to talk to Vivian and she was very nice and friendly. She is so sweet and my grandmother really likes her. She treated us like family. 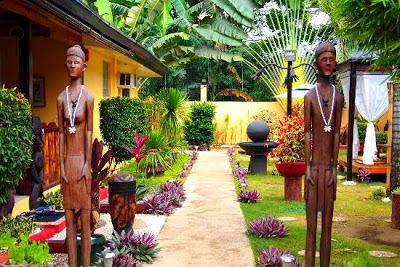 Overall, Tres Pension is not just a cheap hotel in Puerto Princesa but definitely a place you can consider home in Palawan.